Makeup, Beauty and More: L'Occitane 20th Anniversary Collector's Offer: Shea Butter Hand Cream Trio! L'Occitane 20th Anniversary Collector's Offer: Shea Butter Hand Cream Trio! This just in from L'Occitane! If you, like me are a fan of their Shea Butter Hand Cream, be sure to grab this trio soon! Now through March 30th, L’OCCITANE is proud to share their newest Facebook collector’s offer. To celebrate L’OCCITANE’s Shea Butter Hand Cream's 20th anniversary, the brand is offering Facebook fans their three favorite hand creams in an adorable pouch for only $3! 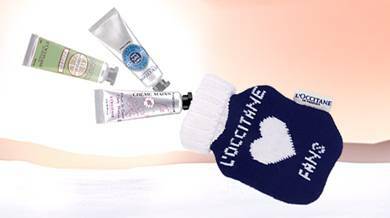 Customers who sign up via the link below will receive an automatic email they will show to redeem in L’OCCITANE retail boutiques nationwide. No additional purchase necessary. Valid in boutiques or online. *No additional purchase is required! Offer not valid in outlets or wholesale partners. Limit one per customer while supplies last.